Sarkari Yojana » Central Government » Electoral Bonds Scheme for Political Donations (Chanda) Launched by Central Govt. 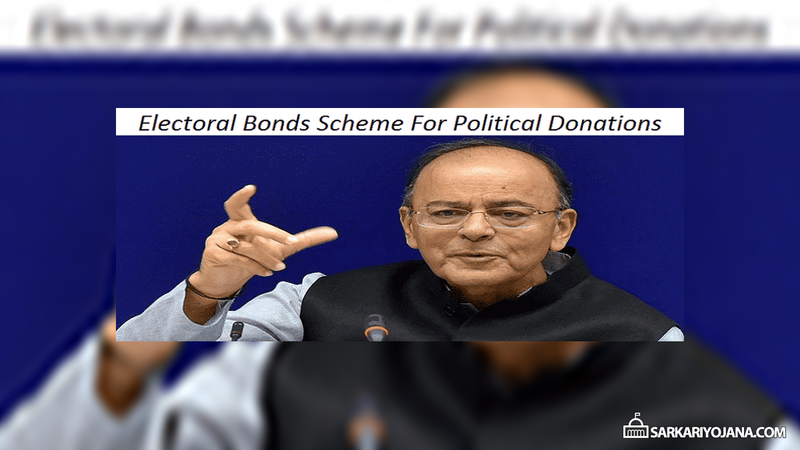 Electoral Bonds Scheme for Political Donations (Chanda) Launched by Central Govt. Central government has launched Electoral Bonds Scheme for Political Donations (Chanda). Subsequently, people can now donate money to the political parties through purchase of electoral bonds from SBI Bank. In addition to this, the receiver political party can only encash this amount through their designated bank accounts. This scheme will ensure transparency in the Political Funding. These bonds will remain available at the specific branches of State Bank of India (SBI) for 10 days each in the months of January, April, July and October 2018. Moreover, these bonds will remain valid for 15 days and will not carry the name of the donor. The 15 days time is allotted so that these bonds does not become a part of the parallel currency. Latest Update – Govt. will open the lines for Electoral Bearer Bond Scheme in March 2018 instead of January 2018 for the first quarter. Accordingly, the First Sale of Electoral Bonds is going to start from 1 March 2018 for time span of 10 days i.e upto 10 March 2018. These electoral bonds will replace the existing system of donation to political parties in cash. This scheme is the next step after demonetization for flushing out the black money from our economy. Every political party with at least 1% vote share in the previous elections can receive these donations. Moreover, all the political parties need to furnish the details of their bank account number to the Election Commission. This money must get encashed in 15 days. All the people can buy these electoral bonds from banks for any value in the multiples of Rs. 1000, Rs. 10000, Rs. 1 Lakh or Rs. 1 crore. The name of the donor will not get disclosed. However, these bonds will get reflected in the balance sheet of donors. A large part of the donations comes in cash through donors from unknown sources. This type of political funding will cleanse the entire system. These bonds will have a life cycle of 15 days and can be purchased for 10 days in January, April, July and October month. Moreover, each political party which receives the donations will have to file return before Election Commission. The Electoral Bonds will remain valid for 15 days after date of issuance. Accordingly, political parties will not receive any amount in case the payment is made after the expiry of validity period. However, the eligible political parties will receive the donation amount in their account on the same day. Under this scheme, the donor will remain in the custody of donor funds till the time the political parties receives the amount. Moreover, these bonds will pay the donations to the political parties with banks acting as intermediary. In the previous budget, Finance Minister caps the cash donation at Rs. 2000 instead of Rs. 20,000 to bring transparency and promote digital donations. This Electoral Bonds Scheme is a next step towards digital donations.